Most Canadians have some degree of awareness about Canada’s diverse Indigenous and Black communities. However, many know little about mixed Indigenous-Black communities and some may not even know they exist. Ann Marie Beals is working to change that. Beals, a first-year Wilfrid Laurier University PhD student of community psychology, is of African Nova Scotian and Mi’kmaq descent. Growing up, she felt that her community was unrecognized, even erased, in Canadian society. Today, she is working to bring Indigenous-Black voices to the fore. One of 26 Laurier master’s and doctoral students receiving a total of more than $1 million in funding through Social Sciences and Humanities Research Council of Canada (SSHRC) Talent Grants, Beals is receiving a Joseph-Armand Bombardier Canada Graduate Scholarship worth $105,000 over three years. The funding will allow her to continue her research into the Indigenous-Black experience in Canada and how to integrate that experience into high school curricula. Beals, a mature student, didn’t come from a family where attending university was an expectation. She entered the workforce after high school, working at a bank and as an entrepreneur. She later became a student support worker at a school board, working with African Nova Scotian and Mi’kmaq youth. Her experience in that position propelled her to further her education. While completing her Bachelor of Arts in psychology, Beals focused on factors that help people from marginalized groups succeed, particularly in post-secondary education. After the youngest of her own three children entered university, Beals felt ready to make the move to Waterloo to deepen her research. She began working toward a master’s in community psychology under Laurier Assistant Professor Ciann L. Wilson, who is also her doctoral supervisor. As part of the Proclaiming Our Roots project, which was led by Wilson, Beals played a major role in gathering Indigenous-Black people’s stories and sharing their experiences and knowledge in arts-based forms such as digital storytelling. 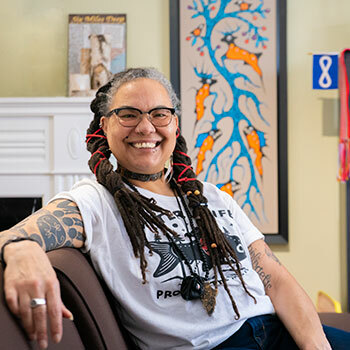 For her doctoral work, Beals plans to take the stories and videos created for the project and turn them into high school curriculum tools with an accompanying module guide to teach students about the Indigenous-Black experience and history in Canada. It’s not clear just how many Indigenous-Black people there are in Canada, but Beals says communities arose out of several waves of Black migration to Canada, including those accompanying the American Revolutionary War and the War of 1812. “In these two particular cases of forced or coerced migration, the British government said, ‘If you fight for us against the Americans, we’ll give you your freedom, land and what you need to start a new life.’ So a lot of African Americans came to Nova Scotia and also to southern Ontario and other parts of Canada,” says Beals. Beals notes that the Mi’kmaq have been stewards of their land, Mi’kma’ki, for more than 13,000 years. Geographic closeness may not have been the only factor resulting in intermingling of the two groups. Though Indigenous-Black people have diverse backgrounds and experiences, what many have in common is a desire to see themselves and their communities recognized, represented and celebrated, says Beals. The Social Sciences and Humanities Research Council of Canada (SSHRC) recently announced funding for faculty research in addition to graduate student funding. Eleven Laurier faculty members are receiving a total of more than $600,000 in Insight Development Grants. One of the recipients is Lindie Liang, assistant professor of organizational behaviour and human resources management at the Lazaridis School of Business and Economics. Liang will research dysfunctional leadership and its effects on supervisors and employees over time. “This grant enables me to collect new data, answer some important questions and support graduate students,” said Liang, who is receiving $62,000 over two years.